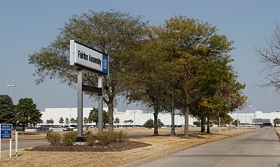 Employees at GM's Fairfax, Kan., assembly plant found energy cost savings worth more than $200,000 per year after attending a DOE training event . General Motors is partnering with the U.S. Department of Energy to lower energy costs at 25 of the company's U.S. facilities. GM said in a statement Thursday that it expects to reduce energy use 25 percent by 2018 by participating in the DOE's national Better Buildings, Better Plants program. The program provides industrial and commercial building owners with assistance in increasing energy efficiency and promotes collaboration among companies to share what they learned. Nissan North America and Ford Motor Co. also are participating in the program, according to the DOE's Web site. GM has implemented 218 energy-saving measures, which it expects will save the automaker more than $7 million, a GM spokeswoman wrote in an e-mail. "General Motors' efforts are helping the nation benefit from energy efficiency," Kathleen Hogan, DOE deputy assistant secretary for energy efficiency, said in a statement. GM also is working with the UAW in being more energy efficient. Employees at GM's Fairfax, Kan., assembly plant found cost savings worth more than $200,000 per year after attending a DOE training event that taught attendees how to save energy by efficiently using compressed air. "By giving our members the proper energy management training, we can ensure that the facilities where they work will be up to speed on industry best practices for cutting carbon emissions," UAW Vice President Joe Ashton, who directs the union's GM department, said in a statement. GM has a separate partnership with the DOE in its Workplace Charging Challenge to help increase the number of employers offering vehicle charging stations tenfold within five years. GM has more than 230 charging stations for its employees in the United States.